With as much vigor as the music that accompanied them, the workers also introduced their own style of cuisine, spinning their Delta blues whilst venturing into their life's other passion: Food. Or, more specifically, good ol' fashioned barbecued pork ribs, with an extra dose of charming Southern hospitality! And so the essence of Morganfield's began. Morganfield's combines life's two greatest passions: music and great soul food. 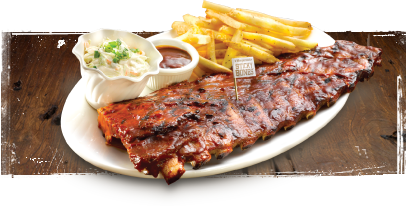 At the heart of Morganfield's is it signature dish –"Sticky Bones" – a truly authentic, old-fashioned, prime pork ribs slow-cooked and smoked in coal and hickory wood to tender mouthwatering perfection, then basted with the gluey sweet-and-sour- tomato based home-made mopping sauce. A perfect accompaniment with good blues music and great friends! During some nights at Morganfield's, you can sense the original toe-tapping excitement of the roaring 50's, venturing back to times when life was stress free and great music and food reigned, easing the long summer's day.